what shortcomings does userbenchmark have? ive found that many reviews are also quite biased and limited by their testing methods. They base their data on people testing their systems, which could be a wide variety of variation. Rather than you knowing the test setup, and methodology behind the test. I've tried to compare memory on that site about a week ago, and it spit out crazy percentages like 30% better performance over another comparable sick of RAM that I know was just insane. It has to being using the comparison with a system capable of much higher bandwidth like quad channel Skylake-X, but it never specified. It just used created values based on systems in it's data base. You never know if people are submitting scores with delided CPU's and overclocked systems to skew results. I admit I myself have looked at it from time to time for ball park references to compare CPU's to other CPU's and reviews, but mostly I wouldn't use it as a reference over a wide data set of multiple reviews. "Alleged Intel Slide Shows Upcoming Mobility Processors With AMD “Vega” Graphics Inside"
"The alleged leak we have is actually a coincidence – as the employee’s name is indeed Vega and his achievement is on mobile performance. What are the chances?" Alright, this is a big false alarm, as it has recently been debunked that the “Vega Inside” is actually from Intel’s employee appreciation campaign, as explained by the Manifesto Agency. It’s a campaign that takes a spin on Intel’s “X inside, Y outside” formula and applied it to employees. The alleged leak we have is actually a coincidence – as the employee’s name is indeed Vega and his achievement is on mobile performance. What are the chances? Like what we’ve always said, rumors are always to be taken with a pinch of salt – and one thing is for sure, AMD GPUs in Intel chips won’t be coming soon – if it’s true, that is. Annother rumor says that: AMD Navi based Graphics cards Might Arrive in August 2018 and it will be 7nm. If it is true, I'm wondering, who is fabbing them? TSMC? We know that AMD is using TSMC 12 nm for Graphics cards, but I don't think TSMC 7nm will be available for AMD so early. We know TSMC 7-nanometer process node has already had several tape-outs (finalized designs) and expects to reach volume capacity in 2018, but we also know Apple (maybe Qualcomm too?) has higher priority. Yeah, I don't think anyone has 7nm ready for mass production yet, especially since both AMD and NVIDIA are currently on 12nm. SANTA CLARA, Calif. — Globalfoundries released a flurry of announcements at an annual gathering here, including an upgraded RF process and a 12-nm FinFET node. Analysts applauded the company’s growing capabilities but said that it mainly needs to deliver in the next 12 months a competitive 7-nm process and show a volume market for fully depleted silicon-on-insulator (FD-SOI). “I’m waiting to see if they hit their plans for execution on 7 nm. That’s the first leading-edge process they are developing on their own,” said Nathan Brookwood of market watcher Insight64, noting that the company licensed its 14-nm process from Samsung. Globalfoundries’ chief technologist, Gary Patton, said that those are, indeed, his two top priorities. “We are very focused on our [FD-SOI] road map, both on the technology and the enablement for its body bias capability, and as for 7 nm, it is an extreme sport with tight process windows that will benefit from EUV,” said Patton in a press Q&A. GF will start before June risk production of a 7-nm node using only immersion steppers doing “some quad and quite a few triple-patterning” layers, said Patton. It targets 60% greater density and 40% more performance than its 14-nm process and acks up to 17 million gates/mm2. The foundry expects to phase in EUV in early 2019, initially just for vias and contacts. “My money is on 2020 for full use of EUV,” said Patton. The big challenges still ahead are in finding a balance of performance and throughput for resists and getting defects out of masks. EUV mask yields are about 65% compared to 95% for all masks. Protective pellicles currently block 30% of the EUV light and need to get down to less than 10% — and none can currently withstand the projected 250-W EUV light source. The good news is that FinFETs will still be useful for “one node beyond 7 nm, and then we’ll have to have something like nanowires,” said Patton. The GF event came one week after TSMC gave an update on its road map. @goldstone77 I wouldn't be surprised at this stage if GF are ready early or on time with their version of 7nm..
Baird noted AMD's estimate that it would achieve 10-percent market share target for its data center processor EPYC in one to two years. AMD said EPYC's architecture responded to customers' need for higher core count, scalability and I/O, with the Zen core architecture offering significantly lower cache and higher scalability." Correct me if I'm wrong here but was it not 8% market share originally they said they were hoping to gain with Eypc.. ? GlobalFoundries has all eyes on them right now! They need to bring 7nm on time or early to gain credibility as a competent on time foundry. And they know it! Will the incorporation of IBM be enough of a driving force to make it happen? That is the question, and like I said all eyes are on them! They need this win badly! Plus their not using EUV on it, initially anyway... I'm sure that will simplify things for them as well. They seem very optimistic about it. Well at the moment anyway I'm sure that could all change. I was trying to be skeptical but to be honest they seem to be on fire at the moment (didn't they just get Vega over TSMC recently ?) and their openly optimistic as well. 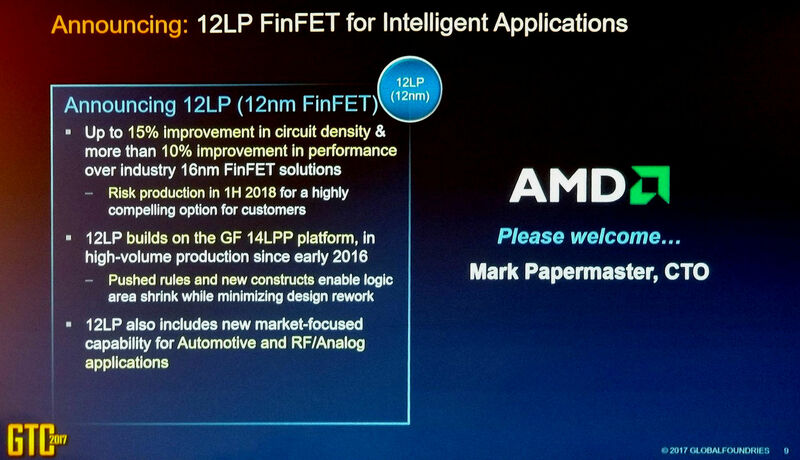 7nm will be not ready next year, otherwise Glofo wouldn't release 14LPP+ renamed to 12LP for marketing purposes next year. The reason why Glofo will release '12nm' next year is just to make the appearance that they are advancing, because other foundries have 10/12nm. Yes, so if you look at the historical share patterns; when you look at Opteron, at our peak with Opteron, we were at 25% plus share. But it took a couple of years to ramp to that share, call it two to three years to ramp to that share. We've put an initial share target out there of 10%. We believe that's very achievable. We also think that's very meaningful for given the datacenter market and the margins there. Could we do over 10? We'd certainly like to. There is certainly aspirations to do that. But in terms of what we have committed in our financial model, we've committed something closer to 10% over a couple of years. It is curious why no Epyc-based HPC clusters are being built... I cannot find any news of any so far anyway, I cannot understand it. Epyc is getting glowing reviews everywhere. For certain workloads it really excels plus it's cheaper 8 channel memory, more address space an way more PCI Express lanes. It wouldn't make much sense for it not to succeed.. Unless of coarse, I hope Intel have not resolved to using dirty tactics to defend their HPC market share... I can see them fighting tooth and nail for it. I wouldn't be surprised if they start offering financial rewards, rebates or other incentives for staying with Xeon. It's pretty early into Q4... Intel is hitting back alright but I would like to see how those numbers look in a month or two..to get a better picture of whats happening. Coffee lake could be causing problems for AMD alright I don't doubt that, although it's out of stock at the moment on amazon ! So 7LP will be ready in 2018, but iI don't expect to see 7LP products until 2019. It's 5-6 months from the point a process is ready to when products are being sold. Why are we talking about HPC and EPYC? That was not an intended market for AMD and they were very explicit about it. So, please stop calling that market out for EPYC. When AMD has tweaked Zen to be a proper HPC CPU, they'll market it as such. computerbase.de is your best bet for accurate data with thorough testing and well documented methodology. They show frame times, FPS, latency and loads of other far more useful metrics. They are on pace to hit double their projections at this time...just FYI. AdoredTV referred to Computerbase.de as an outlier regarding results. All reviews vary somewhat but theirs were way off the rest of sites he referenced. They've also got some vague language regarding their test methodologies, stating that they disable any AMD or Nvidia specific options. But it isn't clear (or perhaps a language barrier) how that affects (or doesn't) things like PhysX and GPU vs CPU usage. People is choosing ARM for HPC clusters. Two or three ARM-based supercomputers are being built. So the older excuse of "dirty tactics" is not working here. The problem for AMD is that those people tests things by themselves. They don't make a purchase decision after reading a biased EPYC review from Anandtech where the performance of Xeons is crippled by 40%. I said two years ago that EPYC was going to be crushed by both sides: ARM and Intel. And time is giving me the reason. AdoredTV is a biased clown. Computerbase.de is serious site. Well Yuka kindly pointed out that it is not being marketed as a HPC product so that explains that I guess. Actually the guy is razor sharp..
His latest article on Coffee Lake is excellent he noticed Intel an MB vendors overclocking boards by default out of the box, skewing results. An it prompting other reviewer's to redo their reviews completely. His Tombraider article was also really good he noticed all the other reviewers where only using Nvidia cards when benchmarking Tombraider, Dx12 & Ryzen... He tried it with two 480's in Xfire an got some very interesting results. It has to be said the guy is an excellent reviewer and as long as he keeps noticing things that no one else does, it will keep me watching his channel that's for sure. He has had some groundbreaking articles that resonated through the community an he deserves some recognition for his work. That slide is wrong, the slide mixed up 7nmLP risk production and 12nmLP volume production dates.